Last year, actively managed equity funds saw outflows of nearly $100 billion while inflows into passively managed funds topped $70 billion1. Exchange-traded funds passed the $2 trillion mark at the end of the year, adding $242 billion in new assets2. Investors have been voting with their feet; passive investments have been on a tear and the prospects look good for continued growth, but the news might not reveal the full picture on active management. Recent statistics trumpet that 85% of largecap equity managers lost to their benchmarks in 2014 and 66% lost to their benchmarks for the fourth quarter. While these numbers were a blow to the active management camp, the headlines may not be telling the whole story. This narrow focus on one segment of the market, U.S. large-cap equities, is where the S&P500, the Dow Industrial Average, and the NASDAQ sit. They are among the most frequently quoted and talked about indices. As a result, many investors believe these indices represent the overall market’s performance, but in reality they only represent a subset. The headlines ignore all the other categories where investors put their money. A broadly diversified portfolio will not only contain U.S. equity investments but as they become more sophisticated, may likely include international markets exposure as well as commodities, alternatives and other diversifying investments. Did active managers perform poorly across the board? The answer is not nearly as clear. While the U.S. large-cap sector achieved double digit returns, most other sectors in equity, fixed income, and alternative investments produced significantly lower or negative results3. 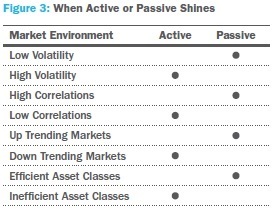 It turns out that the direction of the markets is one of several factors that influence whether active or passive wins the performance battle. Looking beyond U.S. large-cap, we see that active managers had success in a number of categories in the fourth quarter, particularly where performance struggled or was negative, such as international and commodity markets (Figure 2). While developed international markets were down for the quarter, active managers in this category were not down as much as their benchmark. For emerging markets, just under half of active managers beat their benchmark; not a disastrous showing. On the fixed income side, the categories that were negative for the period generally saw outperformance for active managers. The category with the biggest drop, commodities, had the highest incidence of actively managed mutual funds outperforming with nearly 90% beating their benchmark. These results support numerous academic studies that look at different market scenarios where active or passive investment thrives. A recent white paper by our Quantitative Research Group (QRG) examined the merits of active versus passive investing4. While we believe both types of strategies have their advantages, neither strategy wins the battle in all market conditions (Figure 3). Active managers were, on average, more risk averse and hence able to achieve better downside results. They performed better in periods of high volatility or low correlations. Passive strategies on the other hand, performed better in periods of steadily rising markets as well as periods of low volatility or high correlations. Based on these research findings, PMC created a series of portfolios called the PMC ActivePassive Portfolios. By blending actively managed mutual funds and low-cost, tax-efficient funds in varying combinations to match a range of risk tolerances, the PMC ActivePassive Portfolios seek to provide better risk-return profiles than by just using one style or the other. These portfolios leverage the research findings to identify categories where active or passive management has had better success. Additionally, current market direction, volatility and correlations are evaluated to help determine the environment and whether active or passive should do well. The portfolios provided excess return over their benchmarks in the fourth quarter as well as 2014 in its entirety. While PMC research serves as the foundation for these portfolios, allocations to asset classes will shift depending on market conditions, ongoing PMC due diligence, the portfolio manager’s outlook, or Investment Committee mandates. To date, 2015 has shown signs of more volatility. The current consensus is that the Fed increases interest rates during the third quarter, which could then mean very modest results for stock markets. Should this happen, the opportunities for active management may improve: index performance (passive) would likely be more challenged, creating opportunities for stock picking (active). But if the first rate hike is pushed to 2016, markets could experience much better results that could continue to favor passive investments. Understanding how market environments influence performance of active and passive strategies is an important component of portfolio construction and can lead to more informed investment decisions. So, despite passive outperforming active managers in 2014, passive strategies may not have as favorable market conditions in the future. Both active and passive management can play key roles in achieving long-term portfolio success: active for potentially reducing volatility, lessen market downside, and adding alpha, passive for providing inexpensive market exposure. 4 “Active vs. Passive Asset Management: Investigation of the Asset Class and Manager Selection Decisions”, Envestnet | PMC, January 2014. The information, analysis, and opinions expressed herein are for general and educational purposes only. Nothing contained in this brochure is intended to constitute legal, tax, accounting, securities, or investment advice, nor an opinion regarding the appropriateness of any investment, nor a solicitation of any type. All investments carry a certain risk, and there is no assurance that an investment will provide positive performance over any period of time. An investor may experience loss of principal. The asset classes and/or investment strategies described may not be suitable for all investors and investors should consult with an investment advisor to determine the appropriate investment vehicle. Investment decisions should always be made based on the investor’s specific financial needs and objectives, goals, time horizon, and risk tolerance. Past performance is not indicative of future results. Investments in smaller companies carry greater risk than is customarily associated with larger companies for various reasons such as volatility of earnings and prospects, higher failure rates, and limited markets, product lines or financial resources. Investing overseas involves special risks, including the volatility of currency exchange rates and, in some cases, limited geographic focus, political and economic instability, and relatively illiquid markets. Income (bond) funds are subject to interest rate risk which is the risk that debt securities in a fund’s portfolio will decline in value because of increases in market interest rates. Exchange Traded Funds (ETFs) are subject to risks similar to those of stocks, such as market risk. Investing in ETFs may bear indirect fees and expenses charged by ETFs in addition to its direct fees and expenses, as well as indirectly bearing the principal risks of those ETFs. ETFs may trade at a discount to their net asset value and are subject to the market fluctuations of their underlying investments. Income (bond) ETFs are subject to interest rate risk which is the risk that debt securities in a portfolio will decline in value because of increases in market interest rates. The historical performance shown does not guarantee future results. There can be no assurance that the ActivePassive Portfolios will achieve these returns in the future, and principal value will fluctuate so that shares, when redeemed, may be worth more or less than their original cost. Information was obtained from mutual fund managers and third party sources, which we believe to be reliable but not guaranteed. Index and benchmark performance information is presented for comparison purposes only and does not represent the actual performance of any specific investment product or portfolio. Fees and expenses are not included in the performance of an index. Fees and expenses will reduce performance. An investment cannot be made directly into an index. Past performance is not indicative of future results. An individual investor’s situation may vary. Therefore, the information presented in this document should be relied upon only when coordinated with individual professional advice.